Granada is the capital of the homonymous province, situated at the foot of Sierra Nevada, the highest mountain range of the Iberian Peninsula. Located in eastern Andalusia, southern Spain, the city boasts one of the biggest cultural heritages in the country. In addition to the world famous Alhambra and the Albaycín, designated World Heritage Sites by the UNESCO, in Granada´s streets and squares can be found many more monuments. At dusk, a peculiar glow envelops the city of Granada, turning orange the silhouettes of its landscape and the mighty peaks of Sierra Nevada as a backdrop. Just five hundred years ago this same site was inhabited by a now extinguished civilization, Al-Andalus. A folk halfway between East and West which created its own refined culture, leaving a great legacy in the sciences and arts. Granada is a popular tourist destination in Andalucia, it is located next to Malaga and if you rent a car in Malaga you can get to Granada in less than 2 hours. Granada has a reputation for being one of the places where tourists receive more traffic tickets. In the centre of Granada there are a large number of surveillance cameras, radars and signals untranslated into English and thus it is highly recommended to pay special attention to traffic signs and observe the speed at all times. To the fines received by those using a rental car and committing a traffic infraction will be added a small surcharge on administrative fees by the car rental company of about 25 Euros. Granada Airport Federico Garcia Lorca is located 15 km from the city next to the motorway A-92. Granada airport offers domestic flights to Madrid, Barcelona, Palma de Mallorca, Santa Cruz de Tenerife, Las Palmas de Gran Canaria, Lanzarote, Melilla.It also operates flights to different cities and European capitals such as London, Liverpool, Nottingham and Milan. It has received regular flights to Paris and Rome. The railway station is located very centrally within the City. It has daily Long Distance connections to Albacete, Valencia, Castellon, Tarragona, Barcelona and regional trains to Antequera, Cordoba, Cuidad Real, Madrid, Seville, Almeria, Algeciras, Ronda, Loja, Guadix and Linares. The Granada bus station is 3 km northwest of downtown. All services operate from here except the lines to some nearby destinations such as Fuente Vaqueros, Viznar and the Ski Resort of Sierra Nevada. The bus company Alsina Graells travels daily to Las Alpujarras, Cordoba, Seville, Malaga, Jaen, Baeza, Ubeda, Cazorla, Almeria, Almuñecar and Nerja. The highway A-92 connects the city with Almería and Seville in the east and the west respectively, the A-44 with Jaen and Bailen in the north and with Motril in the south. Below you can check the distance from Granada to other cities by car. Granada to Orgiva 53 km. The city is receiving large numbers of visitors, both domestic and international, due to its vast artistic heritage, culture and monuments; others visit to know the Spring Festivals (Easter and Corpus Christi). There is also an important congress and sports tourism attracted by the ski resort of Sierra Nevada, but with no doubt, the most visited heritage site is the Alhambra and its surroundings, as well as the Albaycín and Sacromonte districts. One of the main economic engines along with tourism is the University. The University of Granada is the fourth nationally (after the UNED, Complutense of Madrid and Seville) for number of students and is one of the most popular destinations for European university students under Erasmus and also is Granada one of the most chosen tourist destinations to study Spanish. The Alhambra, a declared a World Heritage Site, is undoubtedly the most emblematic monument of the city and one of the most visited in Spain. 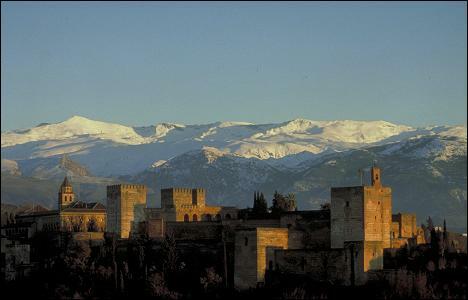 It has a defensive side, the Alcazaba, the Nazarí palaces and the Generalife Gardens. The Albaycín is the old Moorish district which still maintains the urban design of the Nazari period with its cobbled streets and Carmens (high-walled houses with an indoor garden or orchard). Here you will find several viewpoints with breathtaking views, such as Mirador de San Nicolas with views over the Alhambra and the Sierra Nevada Mountain ranges or the Mirador de San Cristobal with views over the Granadian Vega and a great spot for sunset. One access to the Albaycín is through the Gate of Elvira, passing by the Alcazaba walls, coming to Plaza Larga and the Arc of the weights (Arco de las Pesas). The square of Plaza Bibarrambla can be found in the centre of Granada, next to the old Nazari district, with many old squares and extremely narrow streets. Here is as well situated the Cathedral which was built over the former Great Mosque. Plaza Nueva covers the river Darro and is the hub of the Old town. From here, you go up to the Alhambra along the steep street Cuesta de Gomérez, to the Albaycín and along the river of Carrera del Darro. El Carmen is part and parcel of the wealth and urban landscape of Granada city. A Carmen is a typical type of Granadian housing in the hills of the Albaycín. A "Carmen" is a house with a garden and orchard, surrounded by a great wall that prevents us from seeing the interior; from the outside it does not attract attention, but inside is a real oasis of greenery, peace and tranquility. Among the Carmenes with the best gardens are the Carmen of the Cypresses, Acosta and Manuel de Falla. Another outstanding garden is the Carmen de los Martires next to the Alhambra. Granada´s main urban green spaces are the forest of the Alhambra and the Generalife gardens, the Parque García Lorca and the newly restored Botanical Gardens. The province of Granada is an outstanding location for many stunning routes and excursions due to the proximity of both the Mediterranean Sea with the coastal cities of Motril, Salobreña and Almuñecar and the high mountain ranges of the Sierra Nevada. In only one hour’s drive from the city of Granada you can experience ravines, pine forests, rivers, valleys bursting with lemon and orange trees (Valle de Lecrín), stunning landscapes and manmade caves in Guadix or the Moorish villages and the Buddhist Monastery in the Alpujarras. These mountain valleys have a special micro climate, are famous for its water (Lanjaron) and many mineral springs or the Jamón Serrano (mountain ham) of Trevelez. Skiing and having a bath in the Mediterranean Sea in the same day is actually possible in Granada. 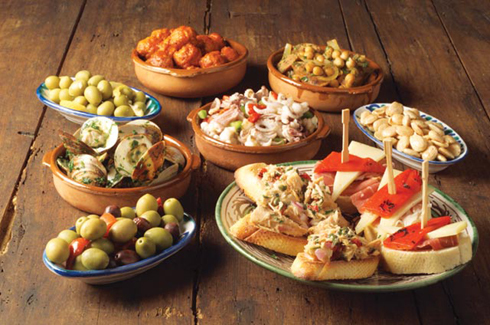 Furthermore in Granada you can discover the authentic "Art of Tapas”. ‘El Tapeo’, is what the Spanish call going from bar to bar to eat tapas (little cold or warm snacks) and which is especially in southern Spain a way of life. In Granada you will be able to sample a great variety of Tapas, as the Granadian kitchen is one of the richest in Andalusia. Furthermore, the Tapas in Granada differ yet in another aspect: Granada is one of the few cities in Spain where you get your Tapa free along with your drink. Since years the city has become a favorite spot for young people. Being a University city with an average of 60.000 Students, Granada has a vibrant nightlife, especially when there is no vacation. Most of the nightlife takes place in the streets and terraces, but of course you also have a wide choice of bars and nightclubs. Granadian Night begins at 11pm, after some Tapas or a nice dinner. In the different districts there are typical routes where people cover three or four bars. The classics are: La Calle Elvira, Campo del Principe or the Paseo de los Tristes, between the Alhambra and the Albaycín. Pedro Antonio de Alarcon is one of the new areas of the city, with over a hundred bars, pubs and all sorts of locations. Plaza Nueva and Calle Elvira attract the more alternative crowd; here are situated many tapas bars and restaurants, pubs and clubs. The calle Elvira is characterized by a large number of Arab teashops. El Albaycín: In this typical part of the town you will find plenty of popular bars with people of the area. Below the Alhambra, next to the river, on the Paseo de los Tristes, you'll find a great selection of classis bars for tapas. In the district of Realejo is situated the Campo del Principe with many restaurants with outdoor terraces, which are very popular in the Granadian summer nights. In the caves of the gypsies in the hills of Sacromonte, you can watch organized Flameno shows. Romería in Honor of the Patron Saint of the city San Cecilio – closest Sunday to the 1st of February: This Romería takes place in the Barrio del Sacromonte, around the Abbey which receives the same name. The city Council offers to all attendees pies, beans, cod and wine, enjoying the mountains in the company of family and friends along traditional dances and music. Cruces de mayo – beginning of May: The celebration of the Day of the Cross starts each year in Granada with a lot of crosses made of flowers and other resourceful materials installed in streets, plazas, courtyards, shops and schools in the capital, with a special presence in the downtown and the historical districts of the Albaycín and the Realejo. The Costa Tropical (Tropical coast) of Granada receives its name due to the exceptional good climate during all seasons, which allowed it two centuries ago to become the only place in Europe where are grown subtropical fruits like mango, custard apple, avocado and papaya. On the section corresponding to the Costa Alpujarreña between Albuñol and Motril, the landscape is very broken, bare and with harsh terrain and beautiful cliffs. Between Calahonda and La Caleta (Salobreña) is 21 km of beach of sandy gravel and boulders. Between La Caleta and the Ravine of Cantarrijan, the border between the provinces of Granada and Malaga, there are 23 km of rugged coastline with numerous beaches, some of them very small and difficult to access. In this area is located the marina of Marina del Este and the protected natural areas of coastal Granada, the Natural Area of the Cliffs of Maro-Cerro Gordo (1.999 m). This landscape of steep coastline between the towns of La Herradura (Granada) and Nerja (Malaga) with slopes that can exceed 80 meters in height, has a very rich and diverse seabed with an important ecological value. 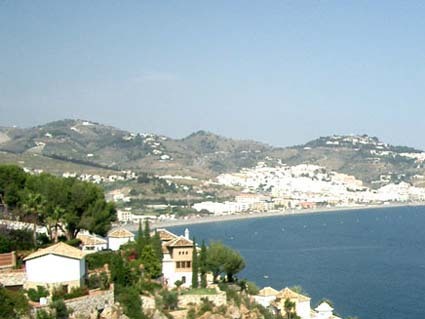 Almuñecar and Motril offer beaches filled with the comforts of the big tourist resorts: La Herradura, San Cristobal or Velilla Tesorillo (Almuñecar) Calahonda, Poniente, Granada, Torrenueva and Carchuna (Motril). All are beaches ideal for scuba diving or fishing. If you are looking for some peace, there are many secluded bays: in Albuñol are the beach La Guardia and natural coves El Caleton or El Pargo. Naturism lovers find true paradises on the shores of Cantarriján and in El Muerto in Almuñecar, la Joya in Motril and El Ruso in Albuñol. Founded by the ancient Phoenicians, Almuñecar is a city with an impressive legacy: two Phoenician necropolis, the Roman ruins of the aqueduct, the Arab castle and other important historical remains. When viewing Salobreña from far, a totally whitewashed village on a hill top, crowned by an old Arab castle, provides an unforgettable image. From the top of this hill there are panoramic views of the Sierra Nevada Mountains, the Mediterranean Sea and the rich lowlands of Salobreña, where are grown subtropical fruits. Motril is the largest resort on the Costa Tropical and is also a popular destination. Here can be found many clubs, shops and large gravel beaches. As in the rest of Andalusia in Granada existed since ancient times the tradition of bullfighting. During its Fiestas de Mayo are celebrated several bullfights in the bullring. In March is celebrated the festival de Tango. An outstanding event during June and July is the International festival of Music and dance celebrated in the gardens of the Generalife, the Palace of Charles V and a thousand and one more spots all over Granada. The car is more of a burden than a help in Granada city, although it is of great use exploring the fantastic surroundings. Traffic in Granada is very congested and there are a lot of reckless drivers. Free parking space is as well a problem and narrow one way streets make you lose your temper. Most practical is to leave your car parked as you enter the city (The Generalife parking is a good choice) and continue on foot or using the public transport or taxis. The bus system is easy to understand and buses run frequently. City buses are considered as the most popular among citizens and many lines are connecting various parts of the city with other places of interest including the Alhambra. Traffic in the Albaycín is restricted, but there is an air-conditioned Micro bus service. Granada is the ideal city to visit on foot, as it is easy to get to the Albaycín or to the very Alhambra from almost anywhere in the city. One of the more interesting and comfortable options for a tour through the city of Granada is a tourist bus service . You can a tour from Malaga to Granada by bus, get informed from the Malaga airport transfers websites.